Problem Statement: How can parents become more invested in the lives of their children as trainers and motivators? Parents have an important role in the holistic development of their children. In today’s society, many parents are often overwhelmed – wondering if they are doing the right thing as they prepare their children for life. Through Oasis Africa Parenting Training Seminars, we remind parents that it is possible to bring up these young ones to become what God intended for them to be. To accomplish this, purposeful parents meet their children’s physical needs, identify their talents and guide them while creating a nurturing environment. Parents train their children with values that form the foundation for balanced living. 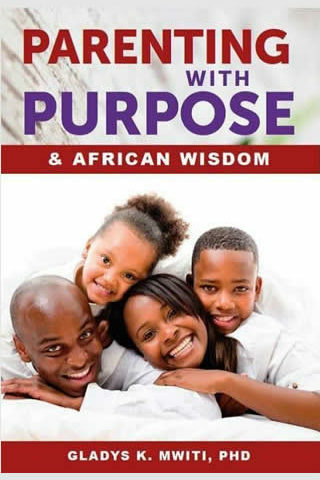 Dr. Gladys Mwiti’s book: Parenting with Purpose and African Wisdom seeks to remind parents of their role in shaping healthy children. Greater parental support has been associated with children’s social competence and psychosocial functioning. In addition, when parents provide organization and consistency in their children’s environment, there is better adjustment. All this is not possible without parental presence, child training skills and limit setting. Parenting Training is available by invitation to seminars and small group meetings. The same is coming soon as Online Webinars. The book is available at Kindle, at Oasis Africa office in Hurlingham, Nairobi, Text Book Center outlets and Keswick Bookshop. Requests for training as well as Book Orders can be placed through admin@oasisafrica.co.ke.